The planet Neptune is the 8th planet from sun and jut next to Pluto the last planet. The orbital period around sun is 164.8 years for Neptune. also ketu or dragons tail is the point of intersection of the plane of zodiac in which the planets move and also the movement of the moon around sun in a different plane. This intersection of two planes creates two points Rahu and Ketu. Why is Ketu treated as Neptune in astrology? Actually western astrology gives number 7 to Neptune, the planet that males a person to love travel, do studies, learn and also have a flair for books and may be business. 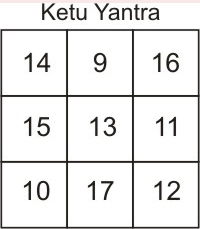 On the similar lines Vedic astrology also treats number 7= ketu, which has similar characteristic like above. Plus the tendency to cut things and make a person spiritual or more inclined to dharma. It may also mean material losses. So as Neptune and ketu connect to number 7 and have almost similar effects they can be treated as same astrologically. This planet ketu is considered to be the adjunct of shadow planet rahu (Uranus). But at the same time it has some qualities similar to moon and some qualities markedly different from moon. People born under this influence could be found to be restless; they love change and travel a lot. Being close to moon a watery planet- they love to travel by sea. At the same time Neptune/ketu people could be very original minded, inclined towards studies and might have strange ideas of religion or philosophy. They could earn well due to their brain power. Books could also be their point of interest. They might have peculiar views and ketu/Neptune people might take a keen interest in occult or religions or some deep study. Ketu or Neptune as per Vedic astrology has 3 prime aspects. That is 5th/7th and 9th house from the house it is placed in. If your ascendant or moon sign has ketu present or aspect of ketu , or you are born on 7th, 16th or 25th- you are ruled by ketu or Neptune. If you have good depth of thought, You are very choosy, not bitten by dogs and some basic interest in travel and philosophy. You might have a fair enough strong ketu. Cat’s eye and moon’s stone. Om Kem Ketuve namaha 108 times. Does Ketu deny material gains? Can Ketu energy cause sucide at times ?Viveka Babaji- famous Indian Model? One famous incident of influence of ketu and how it could contract our minds- is of late ms. Viveka Babajee, who was a well known model. Born on May 27, 1973 and died on June 25, 2010.Her destiny number and date of death =25= 2+5= 7, are both influenced by planet ketu/neptune- creating strong vibrations of self harm. All this is reflected in her horoscope as well- timely help by astrology and prevention by modern medicine could have averted such incidents. Rahu and ketu are ascending and descending nodes of moon. That is the planets of the solar system revolve around sun in a plane in ellipse shape. As moon is the satellite of earth, it revolves around earth in an orbit inclined at around 5.1 degrees with respect to the motion plane of other planets (sun, mars, earth etc.). The average daily motion of Rahu/Ketu is 3’ units. as per drika ganit(astronomical calculations). Where moon is from 13-15 units. Ketu e treated as malefic grahas/planets. ketu forms the planetary army. A Ketu is close to Rahu. Ketu rules scientists or investigators. ketu rules the mixed caste.